Novus needs your help to record its second album, Whoever Has Ears, Let Them Hear. We’re doing our first crowdsourcing campaign on IndieGoGo which has a range of rewards depending on your contribution level. The album is to be recorded by Jesse Lewis, Grammy award-winning producer (Roomful of Teeth and the Boston Symphony Orchestra) and will consist of some incredibly powerful music by Jeff Cortazzo, Eric Guinivan, John Orfe, Robert Pound and Hilary Purrington. Please take a second to support this project. 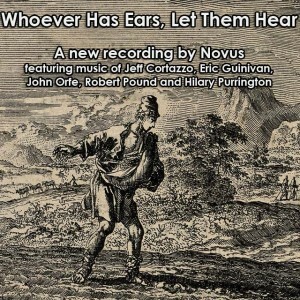 This entry was posted in News and tagged Cortazzo, Eric Guinivan, Orfe, Pound, Purrington, Recording, Trombone Quartet on March 23, 2015 by novus. Eric Guinivan, wrote Incantations for Novus to perform at the 2014 International Trombone Festival in Rochester, NY. The piece is in three continuous movements and beautifully plays with rhythm and pitch. This excerpt includes the end of the first movement, the entirety of the second and the opening of the third. This entry was posted in News and tagged Eric Guinivan, international trombone festival, Live Performance, Novus, Recording, Trombone Quartet on March 5, 2015 by novus.